A sunrise, I think? Well I just happened to have the right colors for it. 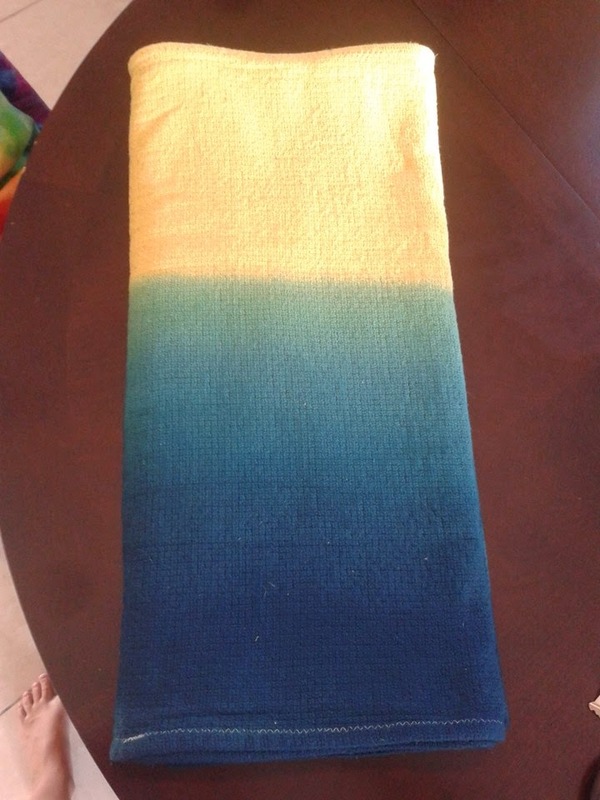 So here goes my best attempt to re-cap how I went about creating my sunrise inspired dye job on my Walters Organic Mini Square Weave Wrap. I’d like to ask in advance that you please excuse my crappy cell phone pictures! First, I dyed the whole thing bright yellow in my washing machine using Dharma’s tub dyeing instructions this past Labor Day. Then from there I went right into grad dyeing it azure blue. After I rinsed until the water ran clear, I washed the wrap in hot water and let it spin dry so that the fabric was still damp. I winged it with my system since I didn’t want to spend a ton of money on it. Maybe one day I will, but I need to make sure I’m good at it first. 🙂 I ended up deciding to use my dining room chairs, my daughter’s shoes, and shower rod to hold the wrap up. I cleaned out our 13 gallon garbage container really good (read disinfect) and used that since I wanted the blue to come up most the wrap. I used hangers and strong clothes pins to hang the wrap on. I had a pan handy for when the dyeing was done. Now to the dyeing part. I have done this before, so I drew from past mistakes which you will unfortunately most likely have to make too. I knew that it would be a good idea to do a test run without water so that I could eyeball where I wanted the water to start and end. Also so I could estimate how much solution I’d need to prepare so that I had enough supplies. I also refreshed my memory as far as measurements for creating my salt/dye mixture & filling solution. There’s a great Dyed Baby Carriers group on Facebook as well as a few blogs out there who have documented their dye experience. Dharma Trading is also a great resource. What it boils down to is there are many ways to do this. You just have to figure out which method jives with the way you want it to turn out. I chose to do a continuous flow so that minimal lines are formed. I started with the salt water at the bottom of the container; 3 cups of salt (some blogs call for 4 but I went with what I had on hand) mixed well in 2 gallons of warm water. For this grad it took 2 gallons of solution to fill to the point where I wanted the water to start; about an inch of the wraps bottom. For the filling solution, I used 3 cups of salt and 2/3 cups of soda ash mixed well in 2 gallons of hot water. Soda ash is the magic that bonds the dye to the wrap if your dye doesn’t already contain it, so don’t skimp on this. After I had my water mixed in the container and had a pot of filling solution ready, I mixed my dye. I used a bit of urea & a little bit of hot water to paste of the dye. I added more water and stirred until smooth before adding to the bath. I mixed it real good and then wiped the sides of the container to reduce the risk of my wrap picking up random markings. I used my son’s asthma tubing for this one, but had a short hose on the way. See how impatient I am? I taped it to the side of the container with duct tape. <— winging it. I used more duct tape to attach a funnel to said tubing then added my wrap to the bath. <— winging it again. From here I added the wrap and let it sit for a few minutes so it could soak up the dye. I then started adding the solution with my trusty Flanigan’s cup. This was working great until my contraption developed a leak. Nothing a wash cloth and some pressure couldn’t fix. Fun times! Really though, this was a lot less work than my last grad which didn’t even come as high as this one. Lesson learned! After about an hour of mixing and adding (3) pots of the 2 gallon filling solution the job was done. I only stopped in short spurts to prepare and make my solution when it was running low. I tried to break up the prep work so that not too much time passed in between fills. I didn’t want lines! I let it sit for about 10 minutes before going to the next step. This is where it got scary. When I went to take the wrap out, one of my daughter’s shoes fell in splashing the top yellow portion. I freaked for a second, then put the pan under the dripping wrap and ran to the bathroom. The splashes washed out, but I was left without my shower rod. My lovely husband brought it to me after he heard me pleading loudly over the running water. Truth is I had been calling him for some time. I put the wrap up in the shower and down it went getting blue dye on the yellow parts once again. Even my husband, who had been complaining about my hobby earlier, sympathized with me. He hoped that all my hard work had not gone to waste in that moment. The wrap was too heavy for the rod since it had absorbed so much water. My guess is because Walter is such a cushy wrap. I’m sure linen or a blend would not retain nearly as much. From here I simply stripped down and took a cold shower with the wrap until the water ran clear. Visualize that one. I was a hot (or cold wet) mess…haha! Fortunately this move paid off and all my hard work was not wasted. I also think that leaving the wrap to sit at the end helped since the reaction between the soda ash, salt, and dye had happened already. So when the top parts got splashed, the chemical reaction wasn’t there to help it stick. Thank goodness! Plus my hose had been delivered so I was ready to try it out. I set up my station once again, only this time I used the larger tub since I wouldn’t be raising the water level as high. I mixed both my solutions the same way, only I filled this tub with 4 gallons of salt water mixture since it was bigger (not sure about the size otherwise I’d share). I dipped my wrap to get it wet, then I proceeded to mix the deep orange dye the same way as the prior time, wiping the sides off before putting the wrap in the dye bath. For this one I filled it slowly (2.5) times with the salt & soda ash mixture via the short hose, funnel, and Flanigan’s cup. Took me about 40 minutes to fill with no leaking this time…YAY! Near the end, I used a measuring cup to carefully pour clear water down the lower part of the wrap. I was trying to encourage the orange to creep up like sun rays. I pulled it out when done and let it sit for a bit before rinsing until clear, washing on hot with textile detergent, and drying on low. As you can see, the orange didn’t do what I wanted, but the end result is beautiful nonetheless. ← Birth Photography – I See the Light! WOW, Lorel! Beautiful work!! I'm amazed. It looks so good. Loved seeing the picture that inspired you, too.